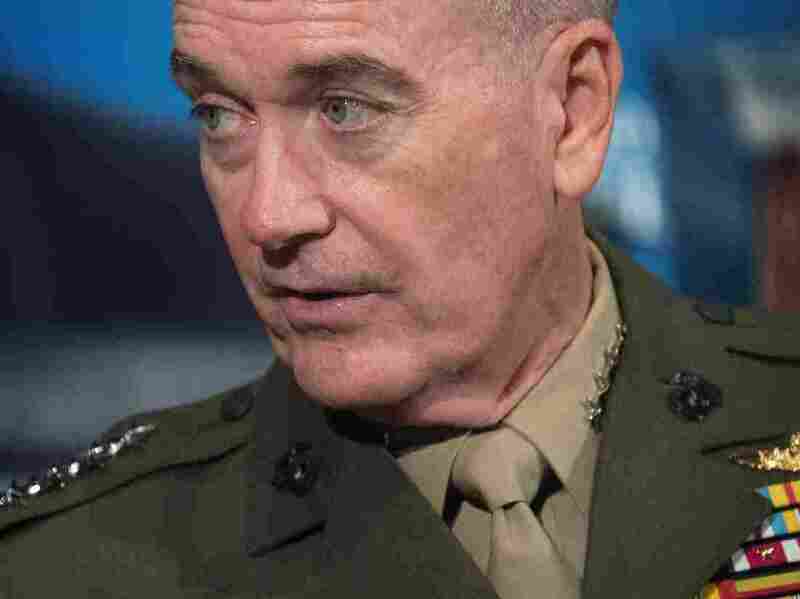 Joint Chiefs Chairman Says Transgender Policy Won't Change Yet : The Two-Way Gen. Joseph Dunford said the Defense Department is making "no modifications" to its current policies on service by transgender troops until more direction arrives from the White House. Joint Chiefs of Staff Chairman Gen. Joseph Dunford said Thursday that the military's transgender policy will remain unchanged until the Department of Defense receives direction from the White House. "I know there are questions about yesterday's announcement on the transgender policy by the President," Joint Chiefs of Staff Chairman Gen. Joseph Dunford said in a statement. "There will be no modifications to the current policy until the President's direction has been received by the Secretary of Defense and the Secretary has issued implementation guidance. "In the meantime, we will continue to treat all of our personnel with respect," he added. "As importantly, given the current fight and the challenges we face, we will all remain focused on accomplishing our assigned missions." The Department of Defense echoed that message, saying it was "awaiting formal guidance from the White House," according to a statement by chief Pentagon spokeswoman Dana White. "We will provide detailed guidance to the Department in the near future for how this policy change will be implemented." The statements come a day after the president tweeted what is apparently a new policy: no transgender people in the military. "After consultation with my Generals and military experts, please be advised that the United States Government will not accept or allow transgender individuals to serve in any capacity in the U.S. Military," Trump wrote. "Our military must be focused on decisive and overwhelming victory and cannot be burdened with the tremendous medical costs and disruption that transgender in the military would entail. Thank you." That policy would reverse an Obama-era policy from June 2016, when then-Secretary of Defense Ash Carter announced that transgender people could serve openly in the armed forces. How Trump intends to implement his new policy is an open question, given that there are already transgender people openly serving in the military. In a press briefing on Wednesday, White House press secretary Sarah Huckabee Sanders said that the White House and the Pentagon would work together to implement the policy, with the Defense Department taking "the lead." But the statement from Dunford pushes back on that idea — and instead indicates the Pentagon is waiting for guidance from Trump. It may be that neither the White House nor the Pentagon relishes undertaking the finer points of what a ban on transgender people in the military would entail. A 2016 study by Rand Corp. estimated there are between 1,320 and 6,630 transgender people on active duty in the U.S. military; other estimates put that figure higher or lower. As NPR's Philip Ewing reports, Trump could call for transgender troops to be kicked out of the military in a systematic fashion. "Troops discharged under Trump's policy would likely sue the government to try to stay in the military and preserve the policy Obama put into place," Philip writes. "Today, in an era in which troops can serve openly, commanding officers would have little problem identifying people violating Trump's policy. But would the Pentagon really demand that serving soldiers, sailors, airmen and Marines be pulled off duty and, in military parlance, 'out-processed' all at once in one big batch? That would be unprecedented."